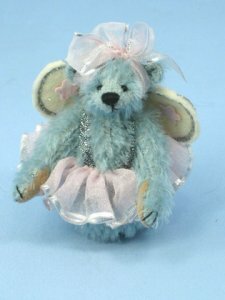 3", 2003, Aqua mohair roly-poly angle bear with jointed neck and arms, beige suede paw pads, black thread nose, mouth and claws, black bead glass eyes. Sheer pink trimmed in silver head bow and tutu with silver suspenders. White wool felt wings decorated with a pink flower on each wing. Tag hand signed by Deb.